The AEROSEM seed hopper features a large opening for filling. This enables rapid and trouble-free filling using Big-Bags or a front loader bucket. A wide sack support with handrail on top of the hopper makes it easier to fill by hand. The rugged roller-tarpaulin serves as a dust-proof and rainproof cover that is convenient to open and close. LED lighting in the seed hopper is standard. 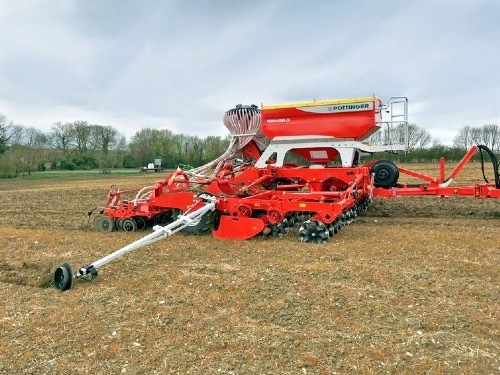 AEROSEM seed drills are fitted with mechanical metering drive systems as standard. The COMPASS CONTROL operator terminal controls and monitors the functions. This robust terminal features an illuminated display and back-lit keys. All function keys are therefore clearly visible in the dark. Take control of seed row switching and save seed material. POWER CONTROL and ISOBUS provide the full range of capabilities during drilling. The AEROSEM metering system is designed for the highest precision to ensure accurate drilling. The metering wheels for the different seed types can be changed quickly and easily using a quick-release. 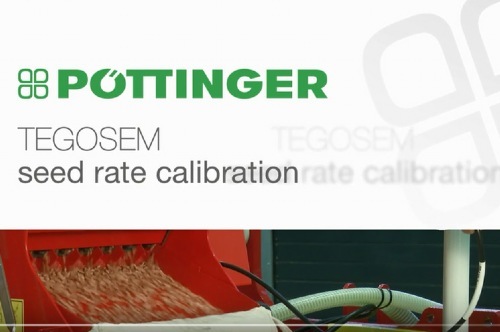 The calibration system is fitted with a practical catch pan that is easy to use and saves time. The calibration flap is monitored by a sensor. Calibration using hand crank for mechanical metering drive. Calibration using control terminal for electrical metering drive. An exit shutter allows the hopper to be completely emptied of seed. The hydraulically-driven blower fitted as standard produces a high air output at an oil-flow rate of just 25 l/min. The high air volume guarantees consistently high drilling accuracy. The air stream protects the seed and its dressing. With a rugged casing made of thick aluminium plate, the blower is also suitable for planting maize. The fan dust filter is standard. On the mechanical metering system a land wheel ensures consistent and smooth drive of the infinitely-variable transmission submerged in oil. The land wheel runs within the width of the machine and does not need to be removed for road transport. As an option, the electric metering drive system can be controlled using a DGPS speed signal. Seed flow rate can easily be adjusted from the tractor seat. Start and stop metering automatically with priming as standard for window-free output. Calibration at the push of a button with practical catch pan. The metering system is made of stainless steel V4A. The seed is fed uniformly to the distributor in an air stream that passes up the riser tube. The design of the distributor guarantees exact division of the seed into each of the coulter pipes. The standard row spacing is 12.5 cm. Non-controlled outlets can be blocked mechanically for wider row spacing. Tramline switching can be selected between two and four rows per track. A funnel-shaped sleeve around the riser tube feeds the seed back into the air stream. The tramlines are engaged automatically using the COMPASS control system. When tramlines are engaged the seed falls into the funnel and is fed back into the air stream. Tramline engagement is controlled by POWER CONTROL or ISOBUS. 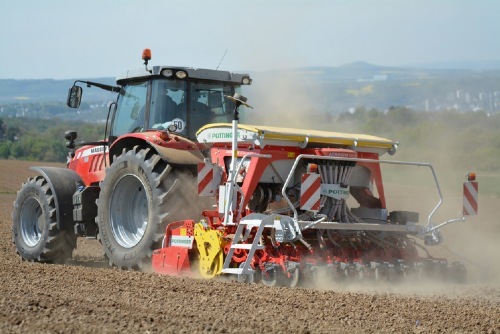 The seed flow rate is reduced in proportion to the tramline rows by the electric metering drive system. The newly-developed IDS system controls all outlets via the BUS system. 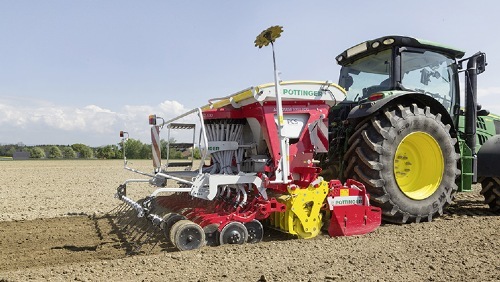 This opens up completely new capabilities in seed row and tramline switching. 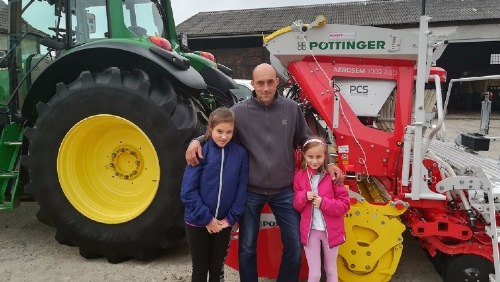 In conjunction with POWER CONTROL or ISOBUS on the tractor and the electric metering drive, there are now no limits to flexible working in the field. The solution for arable professionals. Awarded the DLG Silver medal at Agritechnica 2013. IDS controls automatic seed flow reduction in the metering system during tramlining and half rail drilling. The excess seed is returned to the riser tube via the funnel system. Seed savings of up to 6%. These dished single-disc coulters are mounted on twin-race tapered bearings with special seals. 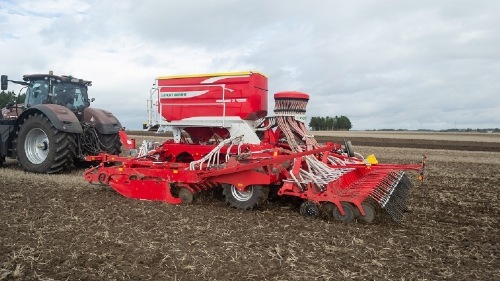 The adjustable, rotating scrapers are located behind to provide plenty of clearance to the side - easily handles large clods. 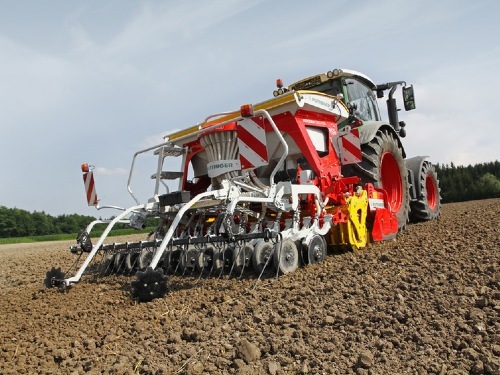 Suitable for light soil with low levels of organic matter. A spring-loaded protective flap automatically covers the coulter if the machine moves backwards. The cast coulter points are wear-resistant. A coulter pressure of up to 55 lbs / 25 kg can be applied to Suffolk coulters and single-disc coulters. Coulter pressure is adjusted on the left and right using an orientation scale. Precise tension spring matching ensures the same pressure is applied to the front and rear coulters. The large DUAL DISC coulters cut right through surface trash to form a uniform, tidy seed slot. Harvest residues are not pressed into the ground. The coulter elements on the inside ensure uniform seed placement even at higher driving speeds. All coulters are guided by pressure rollers. 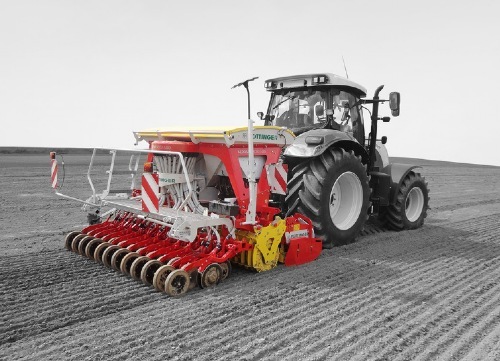 The coulter spacing of 250 mm provides a large clearance and smooth material flow even with large amounts of organic matter. Maintenance-free coulter system with same-length arms to ensure the same pressure front and rear. Coulter pressure adjusted from rear central point on AEROSEM ADD. 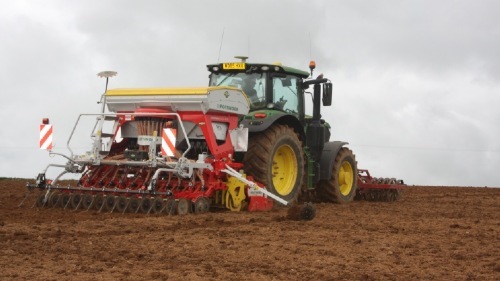 The strong harrow tines feature spiral springs for perfect results. Shocks are absorbed using maintenance-free rubber mountings. Damage is prevented if reversed inadvertently. Outer tines can be retracted for 3.0 or 4.0 m transport width. Can be used together with pressure rollers without additional adapters. The tines are located between the seed rows. These tines are arch-shaped to prevent clogging even in heavy organic material. The edging tine pairs are slanted inwards for a seamless pass-on-pass finish. 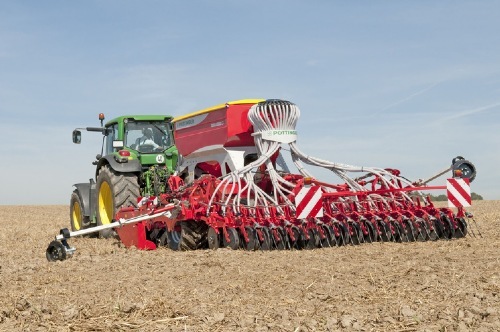 'Perfekt' harrow tines are designed for an especially intensive levelling effect. Offset tine lengths smooth the surface over completely to ensure that seeds are definitely covered even when shallow-drilling. The result is uniform germination of every seed. 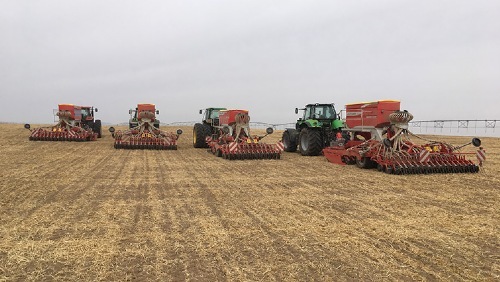 PCS integrates precision seed drilling technology into a pneumatic seed drill, making you independent from single seed drills. This means more flexibility and more economical operation. Awarded the DLG Silver medal at Agritechnica 2013. Several precision metering elements are located beneath the additional hopper funnel. 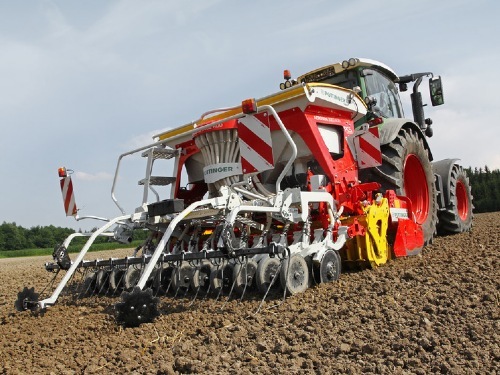 This hydraulically-driven system ensures exact mechanical separation of the seed. The seeds are then transported to the specially-developed injector. The air stream conveys the seed to the coulter. An air flap divides the air stream between the standard metering system and the PCS. Under pressure, the air system injector takes the individual seeds from the seed elevator and transports them at precise intervals to the coulter. A seed flow sensor monitors reliable seed transport and indicates to the driver the accuracy of seed distribution in the seed slot. The DUAL DISC coulter with its integrated seed slot former ensures a perfect seed slot. A firming roller presses the seed into the slot. A press wheel controls re-consolidating and working depth. The seed placement depth can be adjusted centrally. If required, fertilizer can also be applied using the standard metering system in a strip on either side of each seed row. Alternatively, instead of fertilizer, grass seed can be deposited to protect against erosion. The seed tank is simply divided for single-seed drilling using PCS and demand-specific fertilization. The partition walls are repositioned quickly and easily using wing-nuts; no tools required. The hopper then offers space for 400 litres of seed (2 x 200 l) and 800 litres of fertiliser. 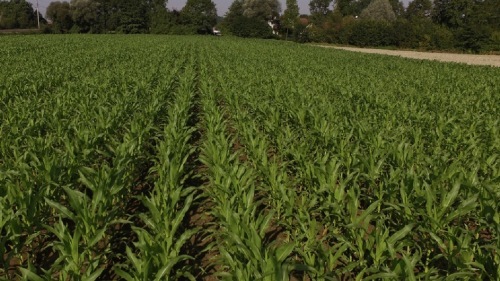 Up to 30% more distance between the maize seeds – more light – more nutrients – increased photosynthesis. Up to 70% more area per plant available – more water – improved effective root penetration – less competitive behavior. Reduces the risk of erosion. Earnings increase in silage maize up to 5.5 % possible. Earnings increase in corn maize up to 5.5 % possible. 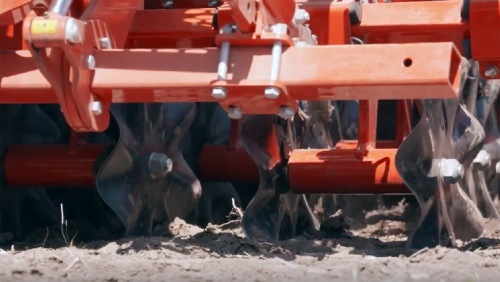 The compact design is possible thanks to the smallest gap between the coulter rail and power harrow roller. 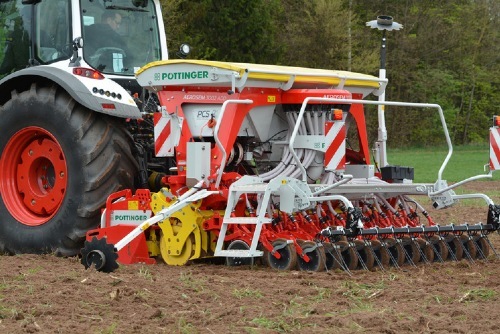 Mounted on a power harrow or compact combination, the centre of gravity is placed far forward. 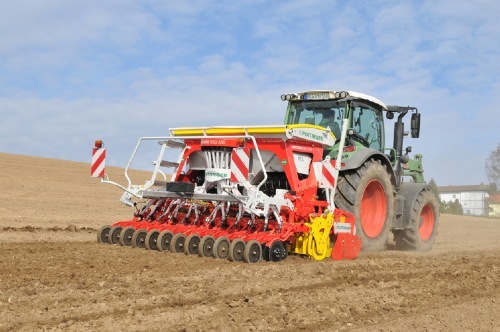 As a result the power harrow can move upwards on stony ground. 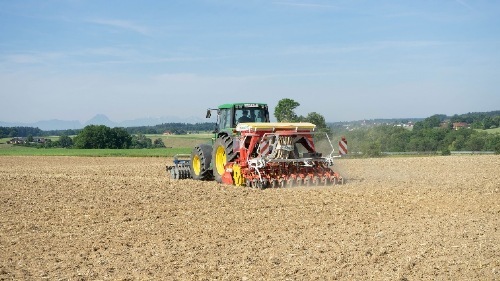 The weight of the seed drill is borne by the rear roller to ensure optimum re-packing of the seedbed. Parking standards are provided for convenient handling. 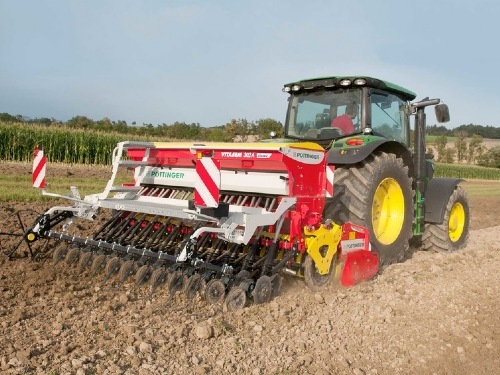 Simply drive the power harrow under the AEROSEM to attach. This is then piggybacked when lifted and just needs to be secured in place. Two lugs on each side ensure secure attachment. The AEROSEM is mounted on the rear roller and is guided by a top link. 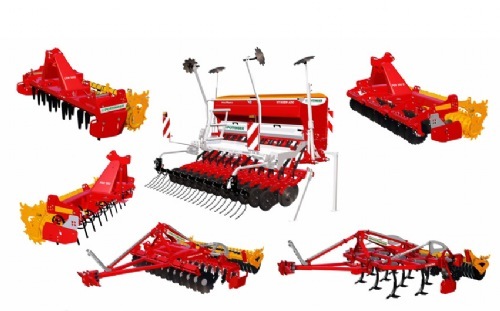 As a result the packer roller and seed drill form a compact unit and enable parallel guidance of the machine. The working depth of the power harrow to be adjusted without correcting the top link. Ground tracking at its best. From filling the seed tank and calibration through to emptying residual seed from the tank, all adjustments can be made on the left-hand side or rear of the machine. The adjustment controls are easily accessible and positioned ergonomically. Easy adjustment with everything close at hand saves time. The 400 mm diameter scalloped marker disc provides a highly-visible marking centreline. The marker can be mounted on the operator platform as an option, controlled by the tramline system. 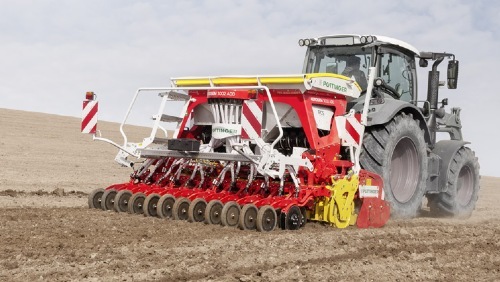 PCS integrates individual seed drilling technology into a pneumatic seed drill, making you independent from single seed drills. This means more flexibility and more economically operation. 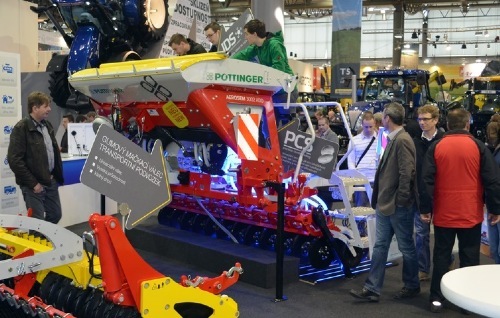 Awarded the DLG Silver medal at Agritechnica 2013.